Moving Truck Insurance Arizona – Great Coverage And Even Better Service! If you want great coverage and even greater service for Moving Truck Insurance in Arizona then Pathway Insurance is the agency for you. Pathway Insurance has helped clients find affordable Commercial Truck Insurance in Arizona, Kentucky, Ohio, Indiana, Tennessee, Missouri, Wisconsin, Michigan, Texas, Colorado, New Mexico, Illinois, Florida, Georgia, and Maryland. To find out if you qualify for huge savings contact us by phone at 800-998-0662 Monday through Friday 9 AM to 5 PM CST, or use our live chat system to speak with an agent online seven days per week until 5 PM. Arizona Moving Truck Insurance – Coverage Scenario: Would This Be Covered? The following is a fictitious scenario to illustrate the importance of understanding one’s coverage. Jack Sprat works for Clean Platter Moving Co.
Like many moving operations, Jack and his moving partner drive their moving truck to a home or business, load furniture and other possessions into the truck, drive to a new location, unload the furniture and possessions, and place them inside the new location. One morning, while in the process of loading their moving truck full with a customer’s furniture, Jack and his buddy come across an enormous shelving unit that they just cannot lift for the life of them. Using all their strength, the best they can do is lift it less than a foot from the ground before they have to set it back down. Since Jack is such a scrawny guy, he often has to use a hand truck to move heavy objects. But this shelf is so bulky and weighs so much that they see no way to get it into the truck using conventional methods. Then Jack has an idea: If they can scoot the shelf right up against the back of their truck, and then use a car jack to lift the shelf vertically just enough, they could then slide it into the truck. After the shelf is in position, the two lift the shelf just high enough that Jack is able to kick the car jack into place beneath it. They set the shelf back down, doing their best to balance it as it teeters precariously on the little device. Jack begins to pump the car jack slowly, and it appears to be working. The shelf is almost in place when the shelf tips too far to one side and begins to fall. Poor Jack tries to get out of the way, but the shelf still lands on his foot, sending him to the hospital. Will Clean Platter Moving Co.’s commercial auto insurance cover the medical expenses for Jack’s broken foot? Movement Of Property By Mechanical Device – “Bodily injury” or “property damage” resulting from the movement of property by a mechanical device (other than a hand truck) unless the device is attached to the covered “auto”. According to this section of the policy, bodily injury caused by the movement of property using a mechanical device other than a hand truck is not covered. Since they used a car jack to lift the shelf, Jack’s broken foot would not likely be covered by a commercial truck policy. By reading and understanding their commercial auto insurance policy language, the two movers might have known better than to use a car jack to lift a shelf. Moving Truck Insurance Arizona – Don’t Wait For Your Insurance To Lapse! Don’t allow your commercial auto insurance to lapse! 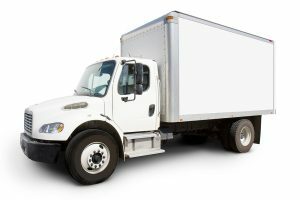 Contact Pathway Insurance now to receive free quotes from a variety of companies offering affordable prices on Arizona Moving Truck Insurance. There is absolutely no risk in getting a few quotes, so why not find out what options are available?